Rick Flag and Katana are investigating the prison facility in Death Valley, from which Max Lord had the villains escape. Back at Belle Reve, Batman is being bought to Amanda Waller, locked up and chained, in which he manages to escape from and demand that Amanda Waller explain herself and release the League. Soon after the Squad realizes that they have the League in custody, and begin to gloat. Superman calls to Killer Frost, and asks why she hesitated in draining his power. She explains that she saw him when she was simply Caitlyn Snow, before her accident that changed her to Killer Frost. She tells him that when she saw him, she felt inspired and it drove her to achieving her goals and becoming a scientist. She tells him that she's glad he survived when she took his powers and that she understands if he wants to take her down, the next time they face each other. He tells her that when he first became Superman he too was scared, and that people feared him as well as many wanted to use his power for themselves, just the same as Waller uses her. He tells her she can be more than a pawn for Waller, and that she too is capable of being better! 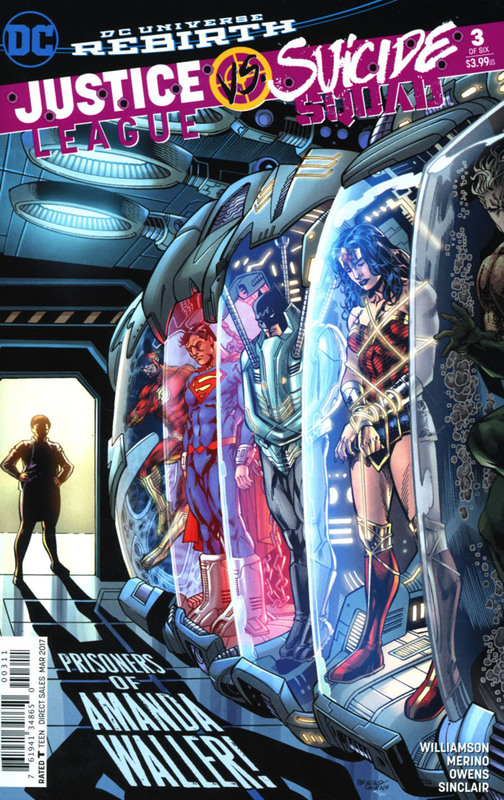 Amanda Waller releases the League from their holding cells, and gathers them and the Squad together to tell them of the current situation with Max Lord and the Super Powered inmates from Death Valley facility. Waller explains to the League and the Squad about who they're up against. She goes through each member one by one, until she gets to Max Lord. Superman interjects and is visually angry when he comes to the realization that Max Lord is behind all this. Waller goes on to explain that Max is after a weapon that could help him take over the world, and she wants the League and Squad to protect Belle Reve and her. She goes on to explain that the team in Max Lord's control are the first Suicide Squad that she put together. Story - 4: I mentioned in the review for the first issue, that it seemed formulaic, and that rings true for this issue too. I felt myself predicting what was about to happen as I read it. However, it did not ruin my reading enjoyment for the issue. I still had a lot of fun reading and now writing a review for it. Williamson I feel has a good handle on these characters. I like the little interactions they have with one another, such as Aquaman telling Croc that he won't like round two if they were to tussle again. And Capt. Boomerang's constant jokes and running commentary. Batman again is of course the manliest of men in the world, as he manages to escape from his restraints... But its Batman, so what else do you expect from him at this point. 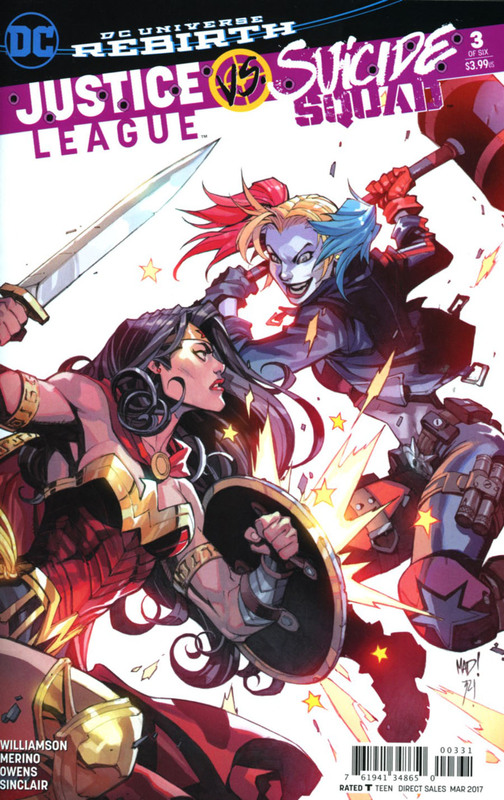 I mentioned last issue, I didn't like that the League was able to be subdued and held in custody so easily. That still rings true for this issue also. I like that Amanda Waller had a Squad before she had her current Squad. And that Max Lord is now using them to do his dirty work. I wonder how much he is "persuading" them with his abilities. Speaking of Max, I love the scene in which Superman discovers Max is behind the breakout from the Death Valley prison that held the original Squad. Williamson and Merino were really able to bring out the painful memories that Superman had with Max Lord, which stem back to a decade ago with the events leading up to Infinite Crisis. Max almost had Superman kill Batman, by taking over his mind, leading to Wonder Woman having to kill Max. Good call back Mr Williamson. Also just what is this ultimate weapon that Max is after? And the other and best Superman moment I felt was the conversation Superman has with Killer Frost, asking her why she hesitated in taking him down like she did. I love that Superman is a beacon of hope, to the point that he can bring out the best in almost anyone. I love that he can get through to her like he does. That scene shows that even powerless, he is still the most powerful. It will be interesting to see what and how Killer Frost does from this point on. Art - 4: I'm starting to see a trend of rotating artists during this event and though I absolutely love Jesus Merino's artwork, I finding it jarring yet again, at the changing of the art styles. Merino for many years was inker to the great Carlos Pacheco. And it shows in his art, just how much of an influence Pacheco had on Merino, and what Merino bought to the table with Pacheco's art! Usually Merino inks himself, however here he has a separate inker, and sadly Andy Owens inks do not compliment the Merino's style. No offense to him in anyway, it just felt some of the shading techniques didn't work. Merino has a style that emits a lot of energy, and has a feel of comics from the 80's and 90's. A lot of that comes through, but in some areas and close ups of faces, it seems very "off". Though Merino I find does make certain costumes work, such as Deadshot's. I mentioned in a previous review that Deadshot's current costume looks dreadful, but somehow Merino makes it work! He looks almost like a G.I. Joe action figure. His rendition of Killer Croc is to be desired. He looks like a scaly Hulk, thick and oafish. One thing I really enjoyed was how Lobo looked this issue. The attitude and physique really looked like the "Main Man". More than what Tony Daniel did last issue. In fact all the villains looked really good. They seemed like a threat. Now on to what I enjoyed the most about the art this issue... Superman (big surprise I'm sure), though he didn't have any incredible fight scenes or anything of the sorts. It was the one shot of him, drawn from the back of his shoulder, where the cape hung lower than the top of his shirt. It reminded me so much of the early 90's Superman artists. It's a small detail, but just looks absolutely terrific, so very majestic. Then of course the burning red eyes... Or the "Angry Red Eyes of Anger" as our own Michael Bailey likes to say. I think they were used really well this issue. As Superman knows what Max Lord is capable, having gone through being controlled by him (previous continuity). I liked his reaction toward Capt. Boomerang's smart mouth comments. Also like the page just before the last, where a close up of Amanda Waller's face resembles Viola Davis. A great drawn and colored issue, sadly the change of art teams is not working for me. Cover Art - 3: I like Merino's art a lot, but I sadly don't think that this covers is all too exciting. What I love about Merino's art, emulating an 80s-90s style, is what I feel let this cover down. Variant Cover Art - 3: Again, not that exciting for me, looks to cartoonish. Variant Cover Art - 5: Now this is much better of a cover. 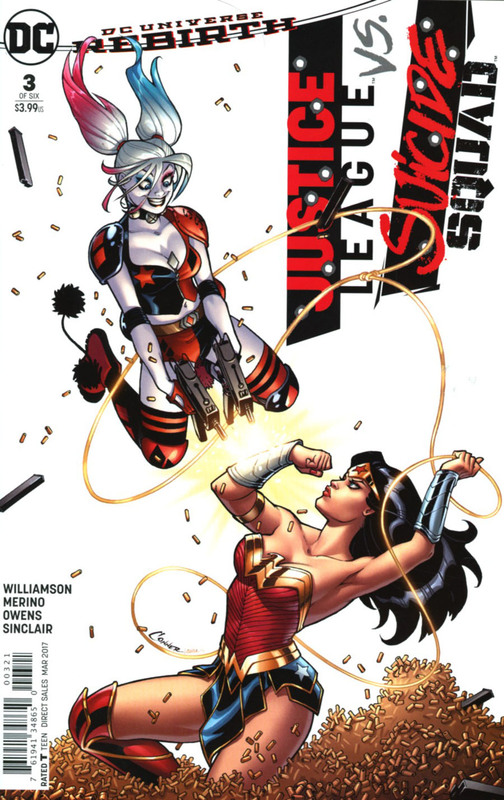 Though just focusing on Harley and Wonder Woman, it has more kinetic energy that the other two covers combined. You could say it's also very cartoonish, this one works. Plus I love Joe Mad's art a great deal!